Hope all of you are having a great start to your new years so far. 2014 was the most eventful so far for in terms of my personal life as well as career and I’m very thankful for that. As of makeup, it’s the year I’ve tried a ton of stuff too. Today I gathered all the makeup I’ve loved this past year and narrowed it down as much as possible! 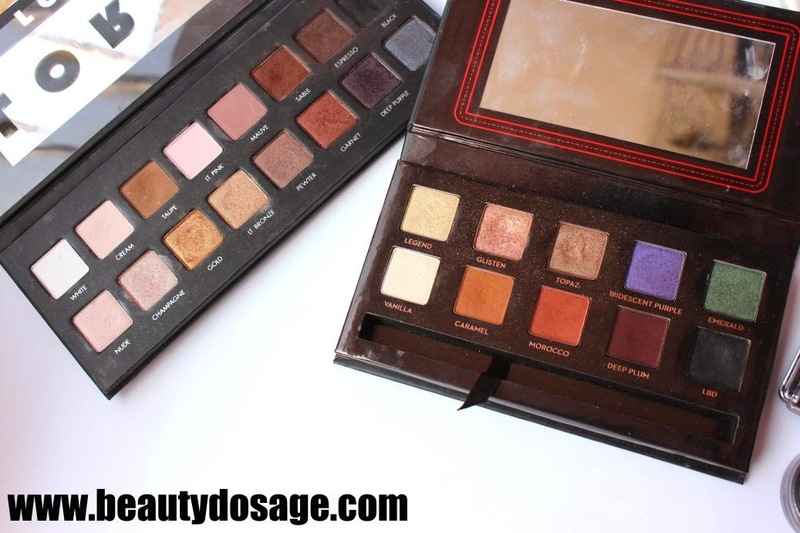 The Lorac pro and Anastasia Beverly hills amrezy palette both have been my go to! Anastasia’s eye shadows are just perfect I’m literally obsessed with that. 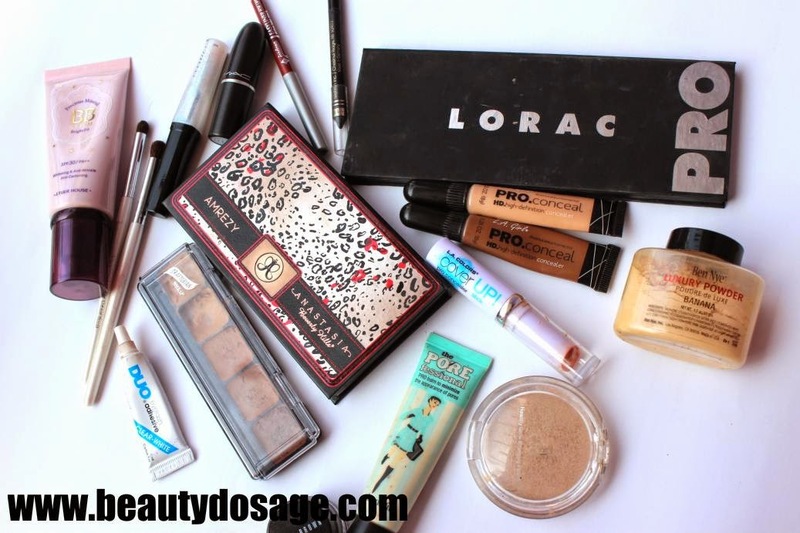 The lorac pro on the other hand I have been using a ton on my clients because of the pigmentation. These are cream foundations which are highly pigmented. The shade range is huge and has shades catering to olive complexions too, which I loved. One thing though is that these need to be set well with powder because of their emollient consistency. The rave is true! 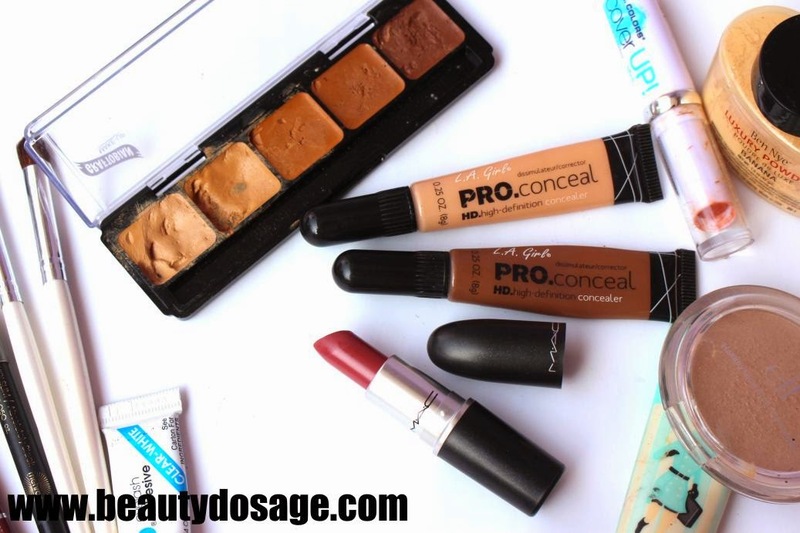 These are drugstore jewels for sure. Ever since Tamanna (Dressyourface) recommended them, there was no going back for me. These are extremely pigmented and blend like a dream. 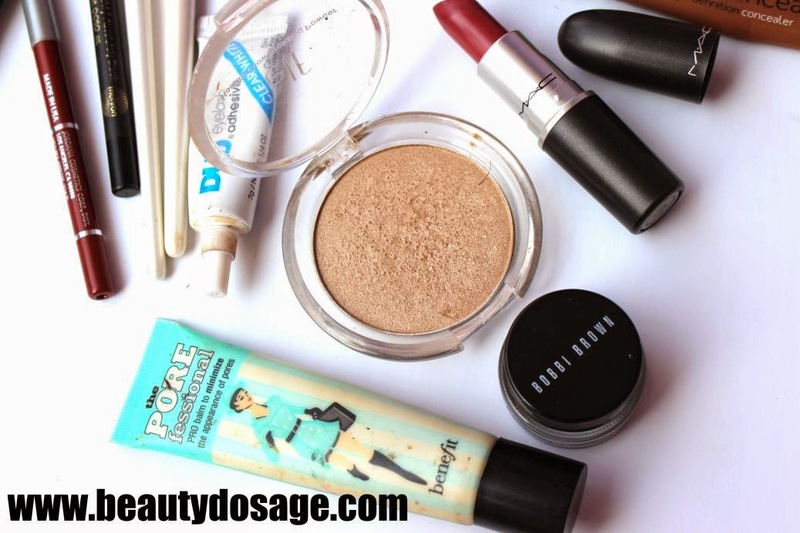 Perfect for cream highlight and contour and is one of the things I cant live without in my professional kit. The shades I like to highlight with are pure beige and creamy beige and the shades I like to contour with are beautiful bronze and dark cocoa depending on the skin tone I’m working with or intensity I need. Me personally being a mac nc42 I use pure beige to highlight and beautiful bronze to contour since I don’t like an intense highlight on myself. Another product raved by everyone and their mothers! I have tried it on various skin types and I can safely conclude that if you have oily/combo skin type and a medium dark to dark skin tone, this will be your best friend to highlight. Ever since I started working as a professional mua, I started getting dark circles which definitely turned around my normal makeup routine. This meant I needed a corrector to avoid the greyish looking under eyes one would get if they were to just use foundation. This is another jewel you guys! This cost me just $1.99 from ikatehouse.com and does the job of correcting perfectly! This has been a routine favorite for me throughout the years! This is a special product that you do not need to use much of. I use this as a target product to the few areas I have open pores. This is a basic pencil but I love it because of the fact that its one of the blackest black I have ever see. 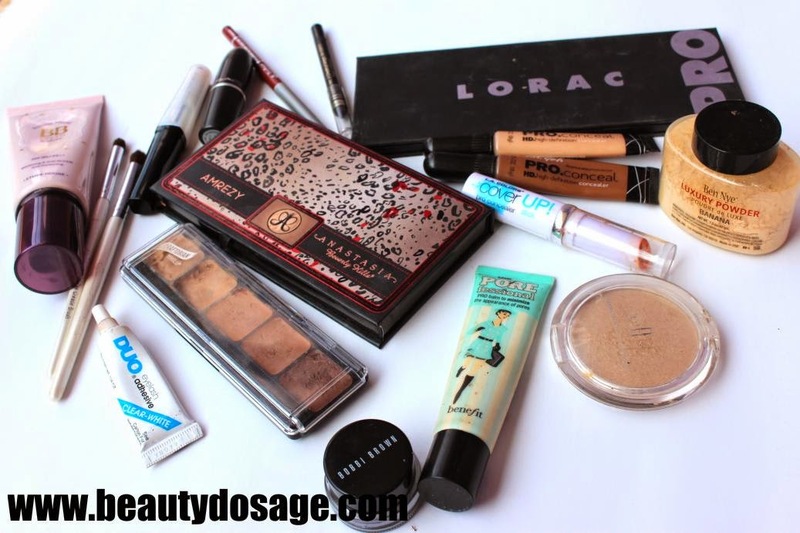 Its great as a base as well as eyeliner in the waterline. This was another product I tried because of recommendation. This was a try after watching carli using it in her videos. Best neutral lip liner ever! This is the most used lipstick in my kit. Everyone seems to love this particular shade and the matte consistency. Another must have in my kit that I’ve stocked up! Great tone of glitter to amp up any look! I love doing eye makeup and these two brushes are amazing in amazing sizes for me. These are also stocked up in my collection. This is by far the best bb cream I have ever tried! It’s almost like a medium coverage foundation carrying moisturizing properties. Only thing is that they have shades for light to medium skin tones only and I use the darkest shade in the line. A must have in my kit. I doo love the ardell lash grip just as much but for some reason have been repurchasing this quite often. Amazing find you guys! This is a gel liner is waterproof enough but extremely pigmented and black as ever! I love the consistency of it and I’m glad it has not dried up which is something all of us hate with gel liners right? Elf bronzing powder in luminance. This is a great dupe to the balm mary lou manizer which gives that candle light glow to the check bones. Although is marketed as a bronzer this is definitely a highlighter!